Darky Room Escape info about the game-Games2Rule. Darky Room Escape is another new point and click escape game developed by games2rule.com. You bought a new house today and you are alone tonight in that house. Suddenly power is cut. What will you do? It's new house. In this darky room you can't see any object properly. You don't know where is key of door and how will be you escape from there. Now you should use you escaping skill. 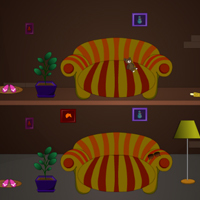 Search useful object and find the way of escape from that darky room. Good Luck. Have Fun!